This is the building that housed the Trans-Siberian Train Panorama in St. Louis, MO. 1904, photo from Wikipedia. Many moving panoramas focused on travel to distant lands at a time when travel was still a big undertaking. These early 20th Century moving panoramas and related artforms involved travel by train. are "crankie-sized," parlor panoramas. The scrolls are between 15"-18" high. PART TWO: The second three examples uses the "scene from a train window" theme in a type of amusement park attraction. - The Panorama Transsberian (1900) - commission by Wagon-Lits, painted by Jambon and Bailly. - Hales's Tours of the World (1905) a company which used film instead of moving panoramas to create the illusion of passing scenery. From London to Paris, a toy moving panorama made around 1905, artist unknown. From the Jacqueline and Jonathan Gestetner Collection. This toy moving panorama was created around 1905, artist unknown. The scroll is painted in watercolor and pen and ink and is 95 feet long. Instead of the usual cranks to move the painting along, it has grips on both spindles. There is writing on the back of the scroll to tell the crankist when to stop and words to poems and songs also written on the back. From the Jacqueline and Jonathan Gestetner Collection. The panorama is described in the video below by Ralph Hyde at the International Panorama Council Conference of 2012. You will enjoy his sense of humor and insight about this beautifully illustrated scroll. Sadly, Ralph passed away in June of 2015. He was one of the great knowledge-holders of moving panorama history. He is greatly missed. You can read more about Ralph's life and works here. From London to Paris, a toy moving panorama described by Ralph Hyde at the 2007 International Panorama Council conference. Pavel Pyasetsky (1843-1919) stands beside his Trans-Siberian Express moving panorama. The Trans-Siberian Express at the Paris Universal Exposition of 1900 - An article written by Arjan den Boer, published Nov. 2014, retours.eu. In 1900, at the Paris Universal Exposition, there were not one, but two moving panoramas of the Trans-Siberian Express. The one pictured here was painted by Dr. Pavel Pyasetsky. It was 15" high and 3,280 feet long!! The scroll was divided into 9 rolls. Read the article here. The moving panorama survives and is housed at the Hermitage Museum in St. Petersburg, Russia. A scene from Dr. Pavel Pyasetsky's Trans-Siberian Railway Moving Panorama. The Panorama Transsiberian. 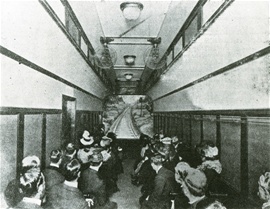 On the right you see the stationary railroad car with the audience inside. On the left you see several moving panorama scrolsl of different heights which moved at different speeds, creating a parallax effect. 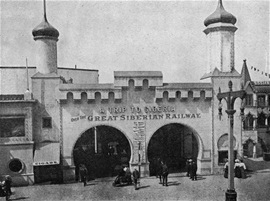 Also displayed at the Paris Universal Exhibition of 1900, was another moving panorama of the Transsiberian Railway. It was comissioned by the Compagnie Internatioal des Wagon-lits (a sleeping car company) to promote the new railway. The moving panorama was painted by French Theatrical scene painters Marcel Jambon and A. Baily. It included shorter scrolls of cut out scenery moving in front of it which is described below. This was not your typical moving panorama show. The audience sat inside a stationary railroad car and looked out the train window to see the painted, moving panorama scenery roll by, creating the illusion of travel. This diagram describes the "Wagon-Lits" moving panorama with the shorter revolving scenery scrolls moving in front at different speeds, creating a parallax effect. 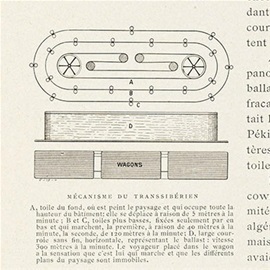 At the bottom of the diagram are the three railroad cars (wagons). Above that is the revolving "sandy ground" which is on tread-mill-like machinery. This moved at 1,000 feet per minute. Next were low, cut-outs of bushes and schrubs moving at 400 feet per minute. Behind that was more distant, taller scenery (trees?) moving at 130 feet per minute. The main moving panorama canvas moved the slowest at 16 feet per minute resulting in the illusion of depth, creating a parallax effect. For more information on this, read the article The Trans-Siberian Express at the Paris Universal Exposition of 1900 written by Arjan den Boer and published 2014 in Retours.ed. It is also described in Errki Huhtamo's book Illusions in Motion, 2013. Excerpt from the 1948 movie "Letter From An Unknown Women"
A three minute excerpt from the 1948 movie. It shows a couple in an amusement park where they are taking the train ride. The scenery that is passing by the window is a bicycle-powered revolving panorama. Thank you to moving panorama historian Erkki Huhtamo for telling me about this. The stationary railway carriages held around 50 people. A "phantom ride" film was projected on the window in the front of the carraige. 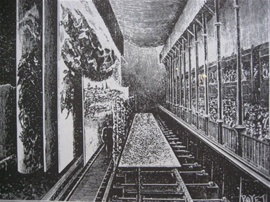 Hale's Tours and Scenes of the World is similar to the Panorama Transsiberian in that the spectators sit inside a stationary railway carriage. It differs in that with Hale's Tours, the audience is watching a film of scenery passing by, instead of seeing a panorama painting rolling by. Patent for the Hale's Tours railway carriage cars. The attraction aimed to give a total sensory experience. A man in a conductor's uniform would take your ticket as you entered the carriage. The show would start with the clanging of bells, a train whistle and sounds of the train wheels turning. The carraige, was manually moved to rock and tilt. Fans in the back of the carraige produced gusts of wind. 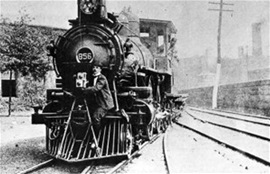 The photographer is sitting on the front of a moving train, making a "phantom ride" film. A "phantom ride" film was projected on the window in front of the carraige. To make a phantom ride film, the photographer was strapped to the front of a moving vehicle (train, street car or boat) while filming! See footage below of a 1907 film of Victoria, British Columbia, filmed for the Hale Tours of Portland. 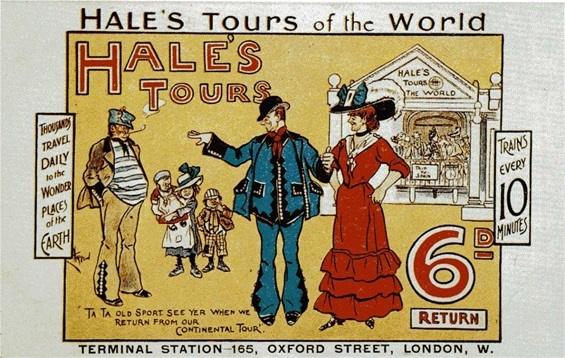 By 1907 there wer over 500 Hale's Tours theaters around the world. This is a postcard from a London theater. This was filmed on May 4th, 1907 by William Harbeck for Hales Tours of Portland. 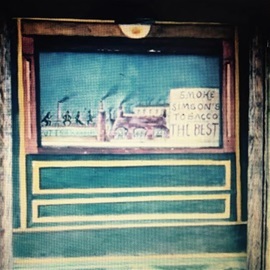 It is one of the oldest remaining films of the west coast of North America.